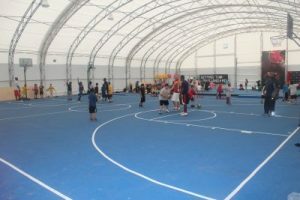 If you need a separate facility at your school for use as a gymnasium or auditorium, consider a fabric structure from Big Top. Our products offer more cost-effective alternatives to traditional, permanent buildings because they require fewer resources and manpower. They also take far less time to construct, and can be disassembled and stored for later use if needed. There are myriad ways we can customize a fabric structure to meet the needs of your school. To begin with, no size is too big or small – the modular design of our shelters allow them to be built to any size. We can also install doors, flooring, insulation, and climate control to name just a few examples of the available accessories we can include with your design. Big Top’s fabric roofs are specially formulated to block 99.95 percent of harmful UV-A and UV-B radiation, offering a high level of protection for your staff and students. This also helps to maintain a comfortable interior temperature that is an average of 15 degrees cooler in the summer and warmer in the winter than the outside temperature. Another benefit of the fabric roof in our structures is that it is translucent and will allow in plenty of natural sunlight to eliminate the need for artificial lighting, which can save on energy costs. Additionally, it is NFPA701 flame-retardant. Our fabric structures are built with a durable, galvanized steel frame that will hold strong through any type of weather. If your school is located in a climate with severe weather patterns, we can engineer the shelter for heavy wind and snow loads and also install lightning protection. To learn more about how we can build a fabric structure to meet the needs of your school, contact Big Top today.